A farmstead nesteld in a splendid Tuscan valley in Casentino where man’s work does not disturb nature. Two unexpected wines, born from a dream and the genteel manners of the man who makes them. Passing a day with Federico Staderini will leave you feeling as though you’ve read an entire bookshelf of poetry, history, science, and philosophy. He hosts us in his Santa Felicita farmstead, not far from a hidden Tuscan jewel, the town of Pratovecchio. As we walk through his vineyards, we cannot help but feel that we are led by Dante’s ancient Roman guide Virgil; the stories and extraordinary anecdotes he tells us are interspersed with French, Latin, Etruscan, and several scientific explanations in English, because that’s how Federico functions. Already as a highschooler in Florence, city life bored Federico. He anxiously awaited the coming summer months when he would while away the long hours in Casentino in the midst of nature. These summer vacations incited him to enroll in the agricultural department at the University of Davis in California, where he later followed courses to become an enologist. He fell in love with wine and his inborn skills were soon affirmed in the mid-80s, when the Marquis Lodovico Antinori asked him to be technical director at his brand-new Ornellaia estate. During the 90s, he was a consultant for small-time, enlightened vine growers who recuperated near-forgotten grape varieties and methods of cultivation by producing fine, niche wines. In 2000, he finally realized his dreams that had been incubating since the summer vacations he spent in Casentino as a young boy. 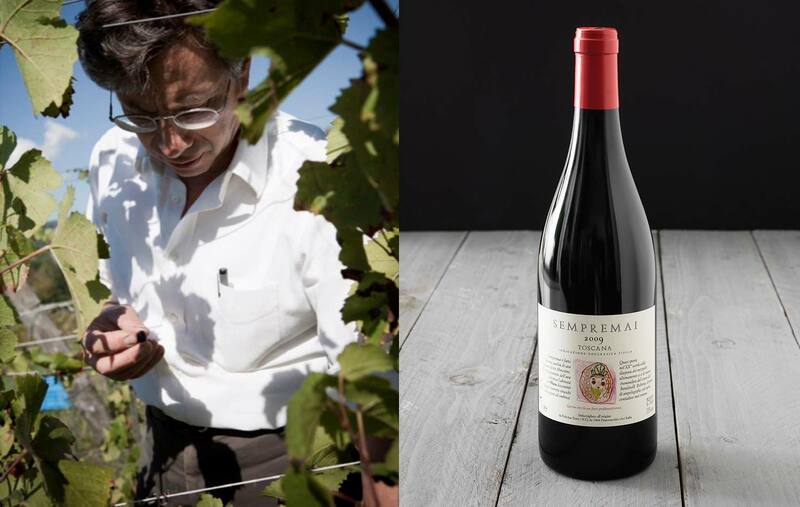 He took full advantage of the unique temperatures of the zone (the nights were chilly even in the middle of summer) to produce Pinot Nero, a wine usually not adapted for making in these latitudes, where the climate is warmer. On the hillslopes where his vineyards receive too much heat and sun to grow Pinot Nero – a “princess,” as Federico describes the grape, that loses her elegance if exposed to too much direct sunlight – he has planted Abrostine. This unfamiliar name is of an ancient Etruscan grape variety grown from domesticated wild vines and others native to the area. The management of the entire farmstead is inspired by biodynamic principles, whose creed allows nature to freely express herself without any chemical or even mechanical interference. The plants are protected with natural concoctions made by Federico; fermentation is carried out solely through indigenous yeasts; and everything from the harvest to destemming and crushing are done by hand or with the help of simple wooden instruments. The two types of grapes require slightly different procedures: the Pinot Nero is delicately pressed in small wooden vats, while the Abrostine is meticulously pressed in order to extract all the skin’s and tiny seeds’ noble elements. Maceration cannot exceed four days, after which the wine rests for 24 months in oaken barrels; using these methods, the astringent notes are balanced and the flavor is harmonious. To fully grasp the essence of sensations that one experiences when drinking the wine, it wouldn’t be enough to simply describe its unique aroma, character, captivating color and notes of spice. There is poetry and culture inside each bottle, and the wines within are a concentration of the land and its history, echoed in their names. Pinot Nero Cuna comes from the toponym of the terrain on which it grows The Etruscan word “cuna” means “cradle,” evoking peace, protection, and the cycle of life. The Abrostine Sempremai (“always-never”) borrows its name from local dialect used to describe the hope for things to come but for which there is no certainty: tomorrow, the future, and life. A totally scientific approach doesn’t take into account the spirit; anywhere that the spirit is found, in plants and in all living things, mere science has its limits. It is for this that, if we know how to listen with our soul, the Sempremai and Cuna whisper of ancient Etruscans, the cool Casentine nights, and the flavors given by nature when mankind follows her life cycles with humility and respect.